So, after checking in, briefly cleaning up and dropping off my bag, I set off again feeling very awake with something like adrenaline (or plain old night-before-Christmas excitement) in spite of being quite tired physically. Or rather, I should say J. M. Barrie's London. Now, all kids know of Peter Pan. They've seen the movie or read the book(s) (or had the book(s) read to them). They know what he looks like and who he is. It's become such an integral part of our culture (Neverland and Lost Boys and Tinkerbell and Wendy) that it's a little surprising to learn there were real people behind the story. A few years ago, I began to write a story set partially in 1917 and partially in 2017 (actually, it was originally 1915 and 2015). In 2017, the characters realize that their names are Peter and Wendy. These are assumed names for the characters, so really I could've chosen anything. But I chose these names for the associations and because it gave them a moment of "oh hey, that's ironic". But the other half of the story, set in 1917, takes part only 13 years after Peter Pan was originally staged. I decided the play itself should have a part in the 1917 timeline. So I researched it a bit and learned more about Barrie and the five brothers who inspired Peter Pan (the character and the play). I became utterly fascinated with the strange and tragic tale. Two of the five boys died before the age of 22: George--the original Peter Pan, the one who said that death would be an awfully big adventure, was killed in World War One--and Michael--after whom the Peter Pan statue in Kensington Gardens is modeled--drowned in uncertain circumstances near Oxford at the age of 20. In any case, the story inspired me, provided thematic fodder, and provided me a "entry point" into the era. I could use these boys' lives to inform my portrayal of a young man of the same age and social status (roughly). My first stop was Kensington Gardens, where, in 1897, J.M. Barrie (who was already a famous playwright) met three young boys who were out in the park with their nanny. The eldest, George, was the one who caught his eye. George Llewlyn Davies was a good-looking boy of five and was charming, while Barrie was a funny, small Scottish man. They got on well immediately, and Barrie started telling stories about George's baby brother, Peter, who Barrie claimed could fly. The third brother was Jack (between George and Peter), and two more brothers were born before Peter Pan came to the stage in 1904 (they were Michael and Nicholas). It should be noted that the boys' mother, Sylvia Llewelyn Davies, was the daughter of George du Maurier, the novelist, and their first cousin was the novelist Daphne du Maurier. Sadly, things got tragic after 1904, but that's a story for another day, I think. 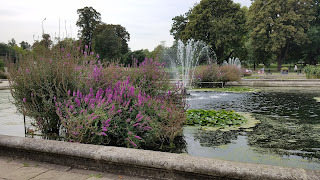 I got off the Tube at Lancaster Gate and crossed into the gardens at the northern end, near the Italian Gardens. These are laid out formally, with fountains and classical statues, and it's really quite lovely. 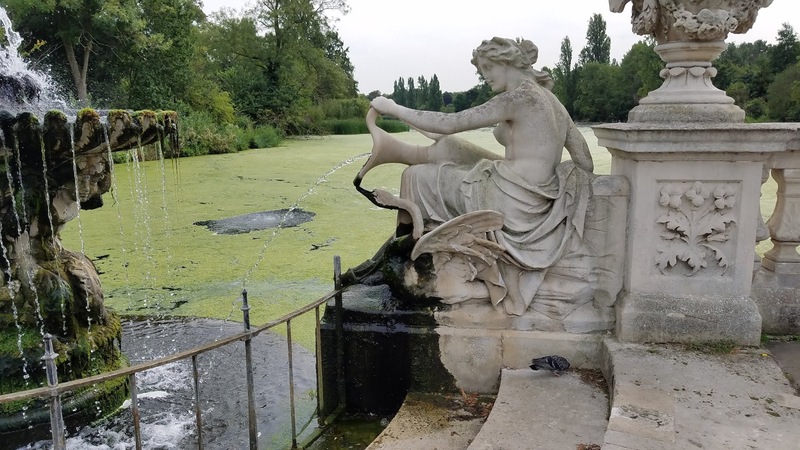 I took a bunch of pictures and enjoyed the beauty of the plant-life, then made my way along the eastern edge of the Serpentine (the big lake reaching southwards from the Italian Gardens). Here, it's a lot less formal and more forest-like, though the buildings of London rise in the distance between the trees. 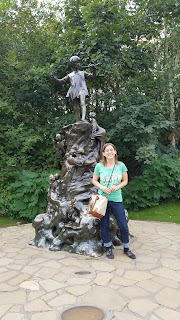 Eventually, I came to the Peter Pan statue that stands on the right hand side of the path, across from the Serpentine. story of Peter Pan got its beginning. Modeled (somewhat loosely) after Michael Llewelyn Davies. This statue was commissioned by Barrie himself in 1914. The artist used pictures of Michael as a basis for the statue, though it honestly doesn't look a lot like him. Barrie wanted the statue to be put up overnight so that it would seem to children as if it had magically appeared. It's a fine statue and a reminder of what started right there in Kensington Gardens and, to my mind, a fitting memorial to Michael, who died too young. My next stop was south and eastwards, in search of some stones that were the impetus of some storytelling among Barrie and the boys. They're actually the markers for London parishes. One says W St M for "Westminster St. Mary", and the other says PP for "Parish of Paddington". Barrie made up the story that these were gravestones, because the truth was much more boring. In Peter Pan in Kensington Gardens, Barrie wrote: "I think that quite the most touching sight in the Gardens is the two tombstones of Walter Stephen Matthew and Phoebe Phelps.... 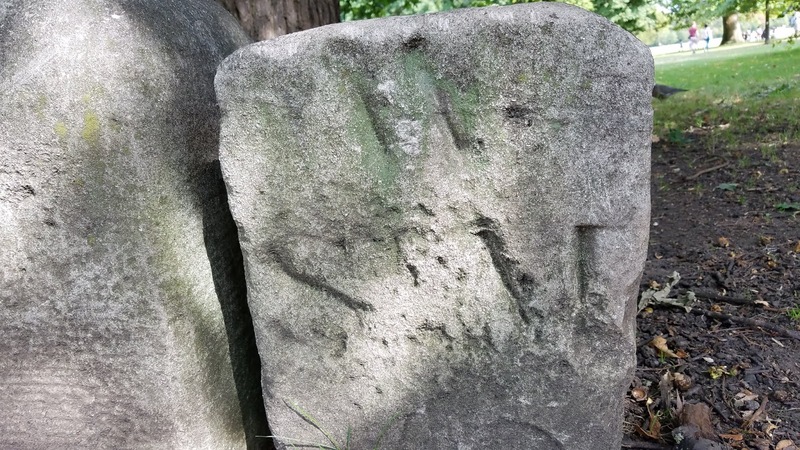 Here Peter found the two babes, who had fallen unnoticed from their perambulators, Phoebe aged thirteen months and Walter probably still younger, for Peter seems to have felt a delicacy about putting any age on his stone..."
But I had yet to find these stones. I got a little turned around and found myself closer to the Albert Memorial than I'd bargained on. I took a picture and kept moving. Where to find the stones. Poor Phoebe Phelps. She died too young. 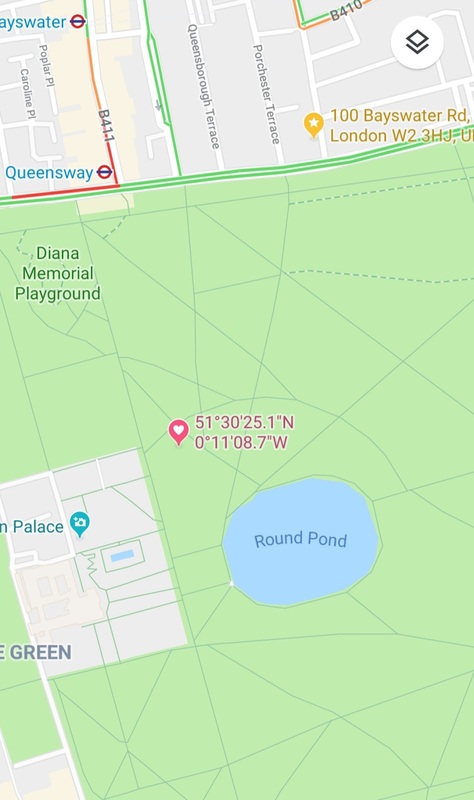 I took a quick turn around the formal gardens out front of Kensington Palace, then headed north up the Broad Walk, passing the Diana Memorial Garden. 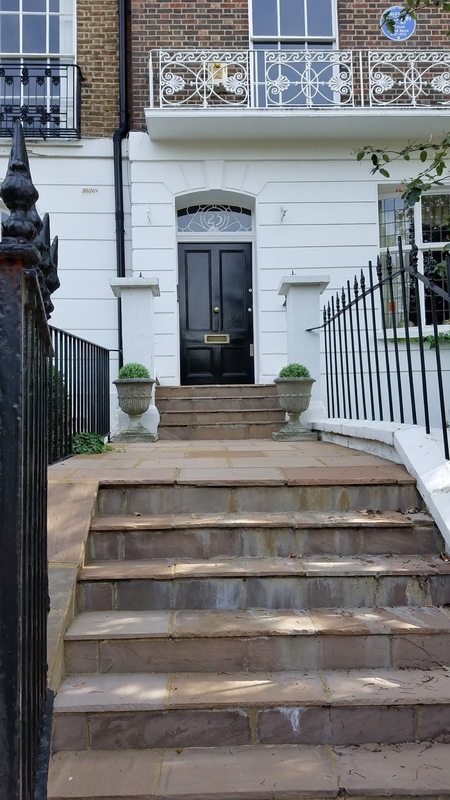 My next stop was to the west of the gardens: 23 Campden Hill Square, where the Llewelyn Davies boys lived with their parents as children. Somehow, I turned too early and ended up doing a bit of a loop, but, at last! there was Campden Hill Square! And there, there was #23. 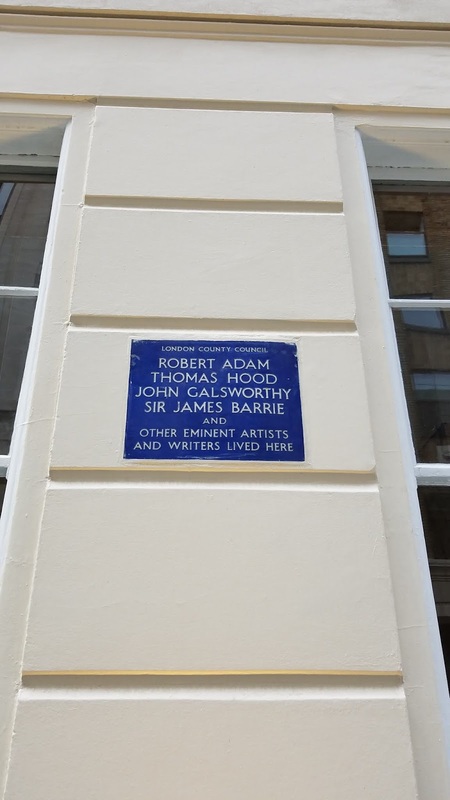 It has a blue plaque--but to someone else who I know nothing about and frankly don't care about. I think it's more important that the boys lived there for most their childhood, even after (spoiler alert) both their parents died and they were under Barrie's guardianship. From the outside, it's a fairly typical London brick townhouse, of late Victorian stock. It's privately owned, so I didn't get to peak inside. There was a small crew packing up their cameras, so I think there may have been some kind of photo shoot going on, of the square or the buildings, I think (not a involving pictures of people, that is). 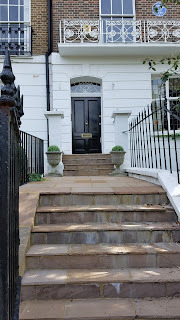 23 Campden Hill Square, where the Llewelyn Davies boys lived. I took a few pictures and got moving. On my wanderings, I found a shop full of American food (it's kind of strange to see a shop full of, like, Lucky Charms and Reese's candy as if they're exotic!). It was literally the "American Food Store". I wandered down Bayswater Road (which, confusingly, has about ten different names as you walk along it; way to be, London). It's a bit of a hike from Campden Hill Square, and my first thought was to take a bus most the way, but then I decided to hoof it. But, somehow, I went too far and ended up at Queensway Tube station, much too far for 100 Bayswater Road. So, exhausted and with hurting feet, I turned around and went the other way because, dammit, I was in London, and I just had to walk more if I wanted to get in everything I intended to get in, because who knows when I'll ever be back. So I retraced my steps, and aha! there it was at last! The house on the corner of Leinster Terrace. It has a blue plaque informing inquisitive people like me that Sir J.M. Barrie lived there when he wrote Peter Pan. 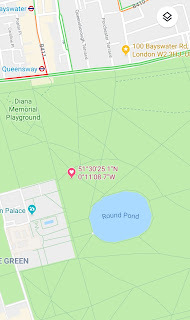 It's actually right across the street from the northern edge of Kensington Gardens. Again, you can't go in, but you can get a look from the outside and glimpse the back of the house. The point is to be there and see it. That was my last (Peter Pan-related) stop for the day. Foot-weary, I got on the Tube at Lancaseter Gate and went back to my AirBNB. My day was far from over, but given the length of this post, I think the rest of the day will have to be another blog. A note: The Gardens themselves were the place to really get a feeling for the atmosphere. The Gardens are still much as they were a hundred years ago, with children and dogs racing around. There are benches like the one where Barrie sat when he met George, and old trees the boys might have climbed. You can experience the same walk the boys and Barrie took to and from the Gardens. 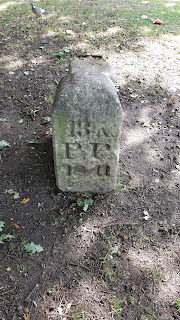 You can get an idea of the contained wilderness of it--there are some tangled areas of managed overgrowth, as well as manicured stretches and hints of years past, like the parish marker stones. The homes are interesting to see, and give you a general idea of London at the turn of the last century--how the middle and upper classes lived--and the atmosphere on the street is probably much the same. But you can't go inside, so it is an exercise in getting a taste of their London rather than a taste of anything more intimate. This was not the last Peter Pan-related site I visited on this trip. 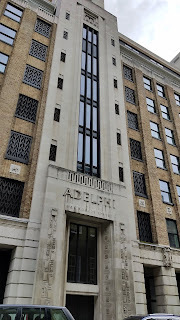 I was back in London at the end of the week, and one of my stops on my last day was Adelphi Terrace. After divorcing his wife, Barrie moved into a spacious flat in Aldelphi Terrace House, just by the Embankment and overlooking the Thames (he was filthy rich, one of the reasons he ended up being the boys' guardian when their parents passed away). 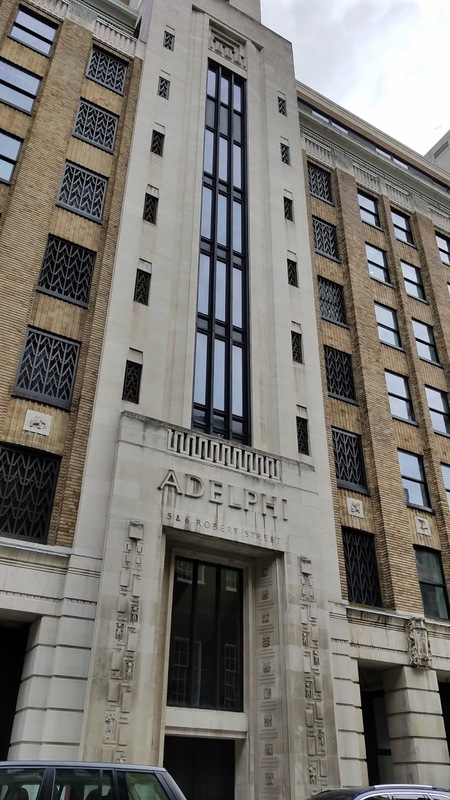 You get off at the Embankment Tube station, go north, turn east (right) on John Adam Street and keep going until you find Adelphi Terrace on your right. Sadly, the building where Barrie lived is now gone, replaced by an Art Deco colossus (one is tempted to say monstrosity). There is a plaque across the street from the building noting that J.M. Barrie lived there (as well as a few others). It was here that Michael and Nicholas lived as children when they were not at school, and where Barrie lived even after all the Five had moved out or passed away. And that, my friends, really is the end of my Peter Pan wanderings . . . in London, at least! 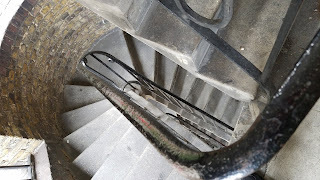 Stay turned for a post about the rest of my first day in the UK, and a later post about a place in Oxford that also has associations with the Llewelyn Davies boys.
. . . And the Old Lock-Keeper's House Restored!